Advance notice of a fascinating archive to be sold at Toovey’s Fine Art and Antique Auctioneers. Lot 3271. CHURCHILL, Winston Leonard Spencer. A History of the English-Speaking Peoples. London: Cassell and Company Ltd., 1956-1958. 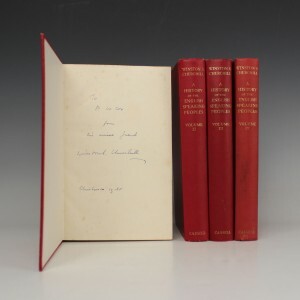 First edition, 4 vols., 8vo (242 x 152mm.) Occasional maps. (Some spotting.) Original cloth (extremities lightly bumped). Provenance: Percy Walter Cox (presentation inscriptions signed by the author to front-free endpaper of vols. I & II, signature to half-title of vol. III and presentation inscription to preliminary blank of vol. IV); and thence by descent. Note: part of The Percy Cox Archive. Lot 3272. THE CHURCHILL FAMILY. – Sir Winston Leonard Spencer CHURCHILL (1874-1965), Clementine Ogilvy Spencer CHURCHILL, Baroness SPENCER-CHURCHILL (1885-1977), Mary SOAMES, Baroness SOAMES, and others. A small archive of photographs, telegrams, autograph letters, signed letters, notes and cards, most relating to the Churchill family’s relationship with Percy Cox, O.B.E., circa 1945-1974. 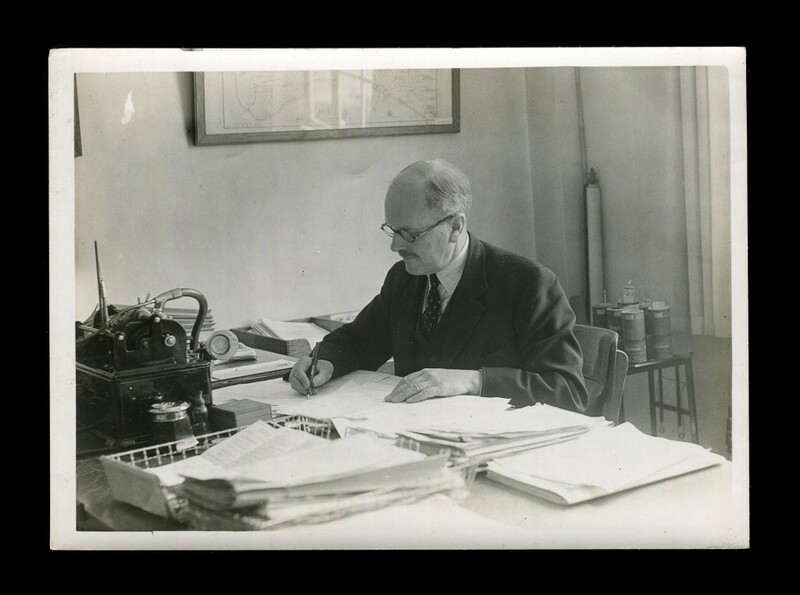 Provenance: Percy Walter Cox and thence by descent. Note: Percy Cox (1888-1975), was the Estates Manager at the Churchills’ home, Chartwell, in Kent in the late 1940s and the 1950s. This interesting archive throws some light on Mr Cox’s work for Sir Winston Churchill and the personal esteem in which he and his wife were held by Winston, his wife, Clementine, and their youngest daughter, Mary. Further details on the contents of this archive are available on request. Excitement is building amongst Whovians as the 50th Anniversary of Doctor Who approaches. Fans of Doctor Who will know that in the stories it was the evil Davros who created the deadly Dalek race. However, it was in fact the writer, Terry Nation, who dreamt up the Daleks. But few will be aware that the man who gave the Daleks form was prop-designer and artist Raymond Cusick. Raymond Cusick lived in Horsham securing the town a place in the Doctor Who story. This important connection is being marked by an exhibition at the Horsham Museum & Art Gallery of Doctor Who memorabilia including a Dalek! The exhibition, ‘2D Adventures in Time and Space: An Unofficial Doctor Who Exhibition’, is the perfect half-term treat, entry is free and it runs until 1st January 2014. We all know what a Dalek is but what sort of Doctor Who creature is a Whovian? In recent years a teenage generation have grouped themselves into fandoms. So if you can’t resist Benedict Cumberbatch as Sherlock Holmes you are a Sherlockian. But if the debate in your household is whether you are most looking forward to seeing Matt Smith, David Tennant or John Hurt as the Doctor, in the 50th Anniversary Special to be screened on 23rd November, then you are Whovians. For me the highlight of the exhibition is the Dalek shown here with Horsham District Council’s Head of Museums and Heritage, Jeremy Knight and Whovian, Emma Toovey. I still find them menacing. An episode of Doctor Who is guaranteed to make me jump out of my skin in fright. Laughing Emma says “You’re as frightening as the Doctor Who monsters when you do that Dad!” She has a point. Jason Semmens’ favourite Doctors are Tom Baker and the earlier Patrick Troughton. Each generation will have their favourite Doctor but what unites us is our delight in the stories and our shared experience of hiding behind the sofa. For me the latest batch of Doctors have been exceptional with the alien quality of Christopher Eccleston, David Tennant’s emotion, passion and energy and Matt Smith’s compassion, courage, determination and humour, not to mention his Harris Tweed jacket and catch phrase “bowties are cool”, I could not agree with him more. You don’t need a Tardis to travel back in time just a trip to the Horsham Museum & Art Gallery as witnessed by Emma Toovey and K9 transported back to late Victorian Horsham’s P. Williams & Co pharmacy from West Street. Many of us now come from generations where our shared memories are often caught up with TV and Film. The ‘2D Adventures in Time and Space: An Unofficial Doctor Who Exhibition’ captures something of our own childhood stories brilliantly. Toys also reflect childhood memories. For example, model railways speak to a generation whose childhoods were defined by a passion for steam engines and an ambition to drive them. For the TV and Film generation toys as iconic as a James Bond 007 Corgi Aston Martin DB5, or a Corgi Batmobile, capture their imaginations in a similar way. Indeed Toovey’s toy sales are a boom market! The Horsham Museum & Art Gallery, according to published information, is the third most visited heritage attraction in Sussex. This is an extraordinary achievement which speaks of the importance all of us place on our common history and heritage. The economic impact of these visitors is profoundly important to Horsham and the broader Horsham District’s businesses and economy. Councillors like Jonathan Chowen understand this. Thanks to them The Horsham District Council continues its important involvement in supporting the museum, the hard work and dedication of its Curator, Jason Semmens and Head of Museums and Heritage, Jeremy Knight. All involved deserve to be applauded. Be transported back in time this half term at the Horsham Museum & Art Gallery and delight in ‘2D Adventures in Time and Space: An Unofficial Doctor Who Exhibition’. 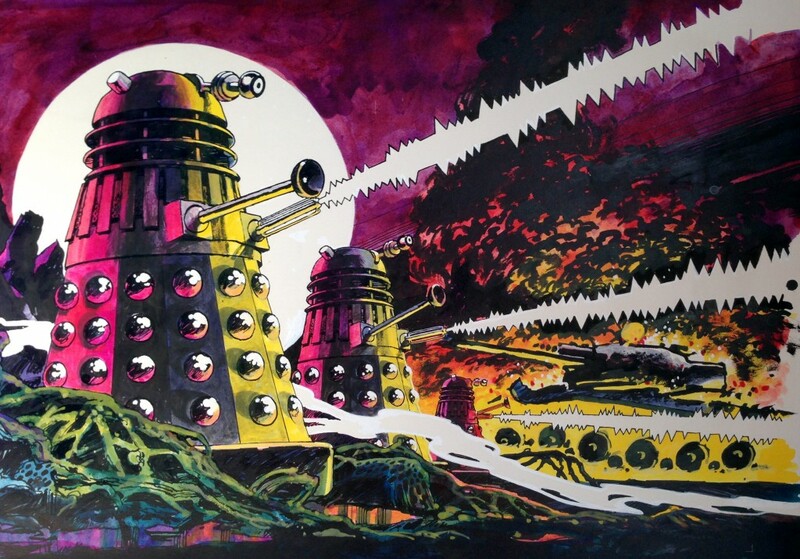 Don’t miss that marvellous Dalek – entry is free! For more information go to www.horshammuseum.org or telephone the museum on 01403 254959. By Revd. Rupert Toovey. Originally published on 23rd October 2013 in the West Sussex Gazette. The UK-based American artist Randy Klein’s work is bound up with storytelling. 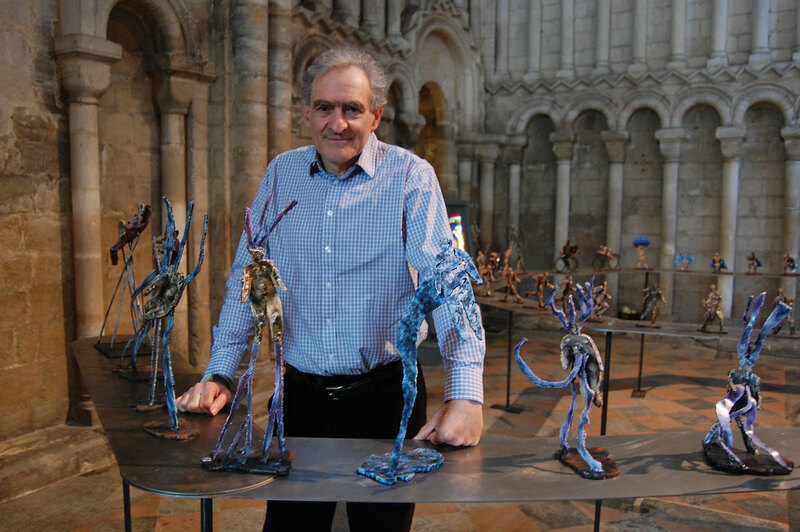 His exhibition ‘Moment to Moment’, currently on display at Chichester Cathedral, brings together one hundred sculptures, which together form a single work by uniting snapshots of a human life. Randy Klein says, “I wanted to capture the feeling of an animation with each single frame of a human journey depicted by a sculpture.” When you first approach the work ‘Moment to Moment’, you are initially struck by the fragmentary nature of the individual pieces but gradually you are drawn to the beginning and from there the story of a human life reveals itself. “It begins in childhood and moves through the discovery of the outside world, adulthood, marriage, children,” Randy explains, “but they are individual moments joined together.” These are precious moments common to many of our individual lives. Randy Klein works in a variety of media, including sculpture, painting, graphics and artists’ books. His limited edition books are represented in the collections of the Museum of Modern Art in New York, the Tate and the Victoria and Albert Museum and he has work in other public and private collections in Europe and the USA. The importance of the interactive relationship between artist and viewer is acknowledged by Randy. From time to time he has visited Chichester Cathedral. “I stand back and listen to wonderful people responding to my work,” he says. The insights displayed in this show have required a great deal of reflection and thought over the last two and half years. The work invites us to look back over our lives and relive those moments which have formed us as people. Among these moments, both our joys and our sorrows are recorded with a lyrical, almost musical ebb and flow, like the rise and fall of notes written on a score. I ask Randy about these qualities in his work and he responds enthusiastically, “There is a section in ‘Moment to Moment’ that I call ‘through all kinds of weather’, which is a metaphor for the trials and tribulations of life. Music in spirituality and in the church is very important to me. I always have music playing as I work in my studio.” The sense of movement in this work is captured by ‘Dance’, illustrated here. The procession ends with an invitation to look through a window and go through a door representing a life beyond this mortal journey, which Randy refers to as “looking beyond the trappings of daily life to our epiphany”. 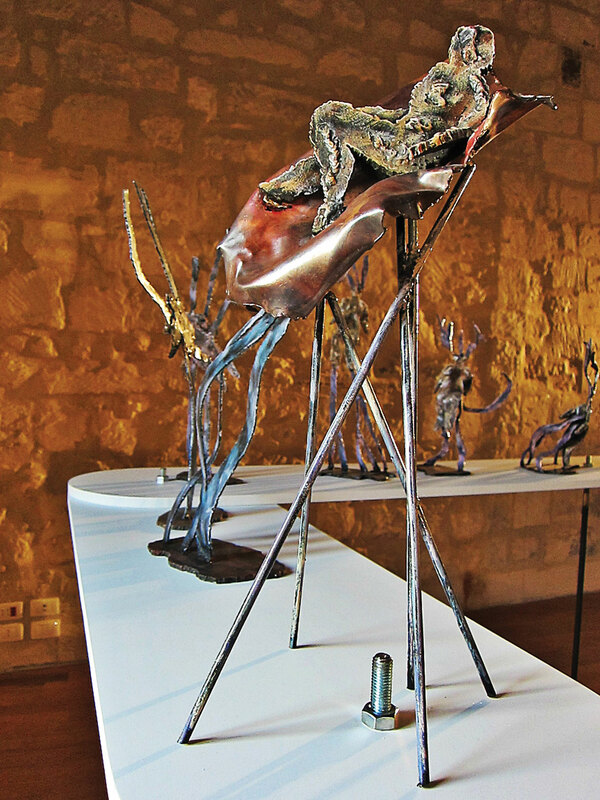 The figures and objects have been forged from copper and steel and Randy has drawn on them in weld, which gives a three-dimensional quality. Many have been patinated to give the effect of bronze. This exhibition has toured Italy and the UK and I ask what Randy is most looking forward to next; he replies, “Getting back into my studio and creating.” Each of us is called to a vocation in life and, whether that is something expressed in the human journey, as Randy sets out for us in this exhibition, or in his own case creating art, there is no peace without answering that calling. 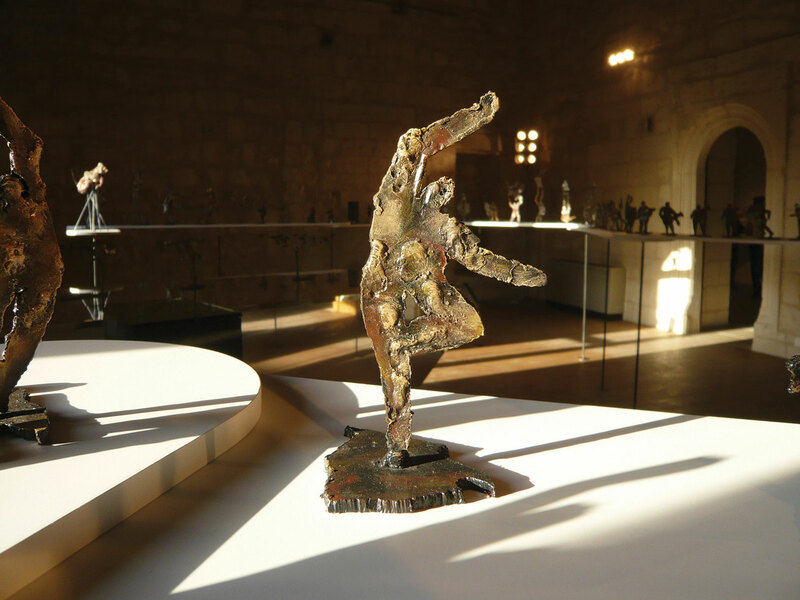 Individual sculptures from ‘Moment to Moment’, this extraordinary tale of a human person, are for sale. As a Christian, I observe how work is part of God’s purpose, bound up with the very fabric of creation. When we work generously and in relationship, it blesses us. It is right, therefore, that we celebrate the beauty in Randy Klein’s work in this selling exhibition, which speaks to both the individual and the common narrative of humankind. The exhibition continues at Chichester Cathedral until 30th October and entry is free. For more information about ‘Moment to Moment’, go to www.chichestercathedral.org.uk or visit www.randyklein.co.uk. By Revd. Rupert Toovey. Originally published on 16th October 2013 in the West Sussex Gazette. 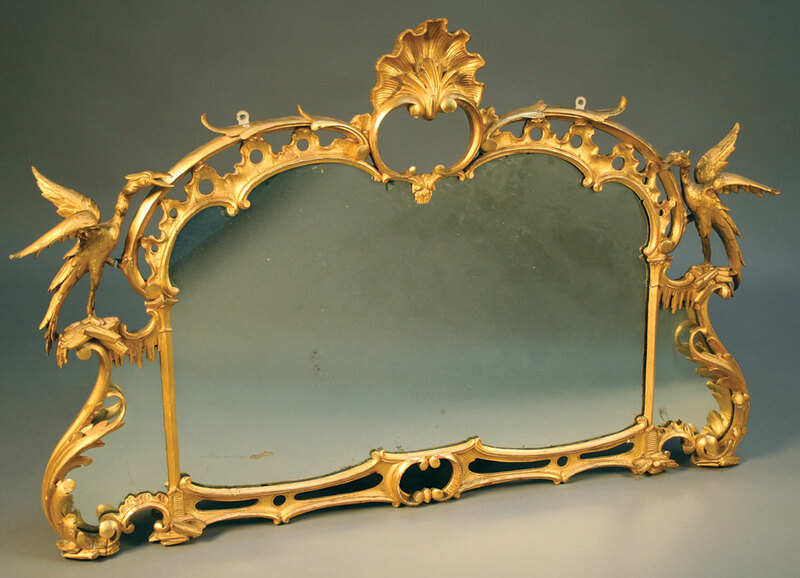 A George III Rococo gilt-framed wall mirror with shell surmount and fabulous birds. Fashion in our own times often seems to be driven in a reactionary way, as one style supplants another. It is perhaps surprising to reflect that this is not just a modern phenomenon. In early 18th century France the style which was to become known as ‘Rococo’ developed in reaction to the Baroque that preceded it. There is a playful quality to the Rococo. Here the classical gives way to decorative motifs drawn from nature and in England even the influences of Chinese and Gothic taste are sometimes incorporated. The Edict of Nantes was passed by Henry IV of France in 1598 to bring to an end the French Wars of Religion, which had raged between Catholics and Protestants in the second half of the 16th century. It granted French Protestants, often known as Huguenots, far-reaching rights to work in all spheres of civil and state life. Although it brought a form of peace to France, Huguenots continued to face hostility and prejudice in what remained a predominantly Catholic country. The edict also had a weakening effect on the French monarchy. In 1685 Louis XIV, the Sun King, famous for his extravagant court at Versailles, revoked the Edict of Nantes and later sought to force Huguenots to convert to Catholicism. Huguenot craftsmen left France in large numbers, taking refuge in Protestant countries like England, Holland and Switzerland. In this country they had a profound effect on the life of our nation. For example, the first Governor of the Bank of England, Sir John Houblon, and several of his directors were of Huguenot origin. They also brought the influence of French tastes and styles. It is difficult to determine where the weighty Renaissance Baroque of Louis XIV’s reign ends and the Rococo begins in France, as one grew out of the other. The term ‘Rococo’ is a 19th century creation, a combination of ‘rocaille’, referring to shellwork, and ‘barocco’, a term first used in a rather disparaging way to describe the outmoded Baroque style in the early 18th century. It was not until the 1940s that Rococo assumed its present association with this style. In 1715 Louis XIV died, leaving his five-year-old great-grandson as heir to the French throne. He would later become Louis XV, when he had reached maturity. The French Regency under Philippe, the Duc d’Orléans, lasted until 1723. The Régence style marked a new phase in the development of the French Rococo and by the 1730s it had developed into the ‘genre pittoresque’, which saw rocky caves, dragons and waterfalls, embellished by shells, bocages and putti, employed in romantic compositions which delight in their playful and spirited designs. Major exponents included Nicolas Pineau (1684-1754) and Juste-Aurèle Meissonier (1695-1750). By the reign of Queen Anne (1702-1714), England’s furniture-making industry had found its own and particular voice. By the 1720s in London, it was concentrated around St. Paul’s Churchyard and Palladianism was the predominant taste. Its restrained classical lines and proportions were inspired by the Venetian architect Andrea Palladio (1508-1580), who himself was influenced by Greek and Roman architecture from classical antiquity. Palladianism was expressed beautifully in this country by the extraordinary architect Inigo Jones (1573-1652). William Kent (1685-1748), under the patronage of Lord Burlington at Chiswick House and British Prime Minister Sir Robert Walpole at Holkham Hall in Norfolk, continued in the Palladian style. Indeed, Holkham Hall is perhaps Kent’s most complete expression of the Palladian taste and, to my eye, one of the finest houses in England. In 1735 William Hogarth founded the St. Martin’s Lane Academy in London. Influenced by the French Régence and in reaction to the restraint of Palladianism, the Academy was chiefly responsible for the promotion of the Rococo style in London. The importance of nature in ornament and the beauty of the serpentine line were inculcated in a generation of furniture makers by teachers like Louis-François Roubiliac. As the furniture-making industry in London gravitated towards St. Martin’s Lane from St. Paul’s Churchyard, it increasingly brought cabinetmakers into the sphere of influence of the Academy and the Rococo style was quickly assimilated. Anti-French sentiments in the mid-18th century led to an anglicising of the Rococo taste. The English Rococo taste is typified by its use of asymmetrical ‘C’ scrolls, cartouches and acanthus leaf foliage in combination with rockwork, animals and naturalistic trees. 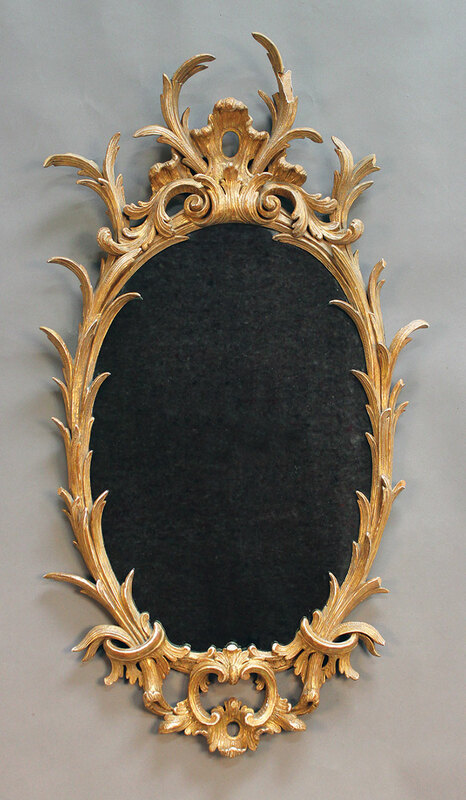 The George III Rococo giltwood and gesso-framed wall mirror illustrated, with its shell surmount, rockwork frieze, scrolls, foliage and fabulous birds, captures much of this taste. By the 1750s, both Chinese and Gothic influences had been added to the Rococo decorative vocabulary. The Gothic taste was popularised by Sir Robert Walpole’s son Horace and his famous Strawberry Hill Gothic villa, which he built at Twickenham between 1749 and 1776. 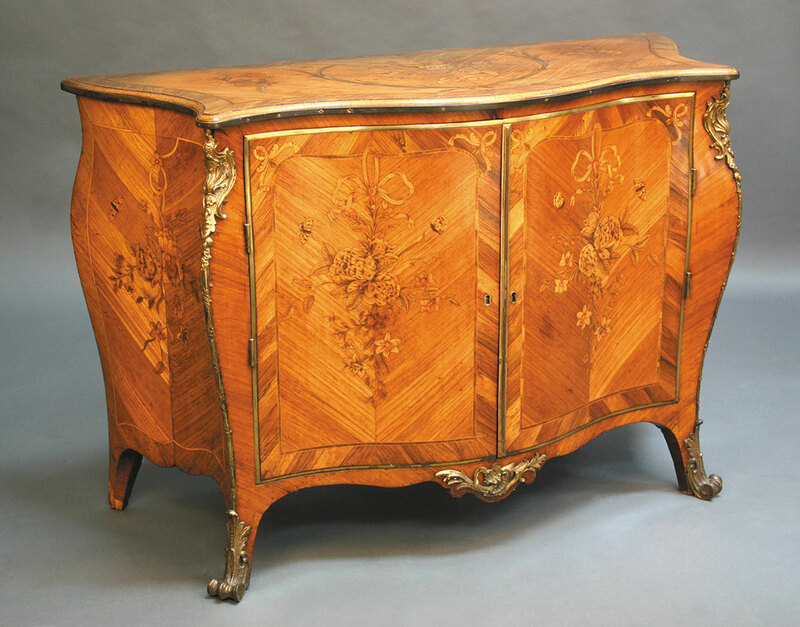 An early George III kingwood parquetry and marquetry commode of serpentine bombé form, attributed to Pierre Langlois, auctioned at Toovey’s for £160,000. 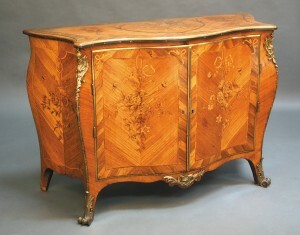 The influence of French taste is clearly evident in the early George III kingwood parquetry and marquetry commode illustrated, attributed to the celebrated French cabinetmaker Pierre Langlois. The commode is very similar to a pair of commodes commissioned by William Craven, 6th Baron Craven (1738-91) for Benham Park. The Craven commodes were attributed to Pierre Langlois, in association with the bronze-caster and gilder Dominique Jean, in a series of articles published in ‘Connoisseur’ magazine by Peter Thornton and William Reider, 1971-72. Pierre Langlois established himself as one of the leading cabinetmakers in London while trading from his premises at 39 Tottenham Court Road between 1759 and 1781. His clients included many important figures of the time, including the 4th Earl of Bedford for Woburn Abbey and Horace Walpole. The commode was banded in palisander, the top inlaid with ribbon-tied summer flowers within a stiff-leaf cartouche, flanked by two flower sprays. The sides and two doors were inlaid with swagged summer flowers, ribbon bows and moths, while the front projecting corners, apron and feet were decorated with ormolu shell and acanthus-leaf scroll mounts and sabots. The interior was fitted with three palisander-fronted drawers and Rococo-shell handles. The carcass and shaped apron were supported by outswept tapering bracket feet. The commode was auctioned at Toovey’s for £160,000. In the October Specialist Furniture Auction Toovey’s offered a collection of fine 18th century English furniture, consigned for sale by The Royal College of Radiologists in London. 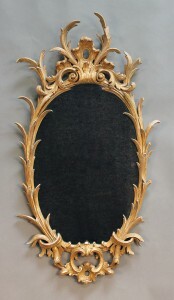 Highlights includes a number of gilt-framed Rococo wall mirrors. The example illustrated sold within estimate for £1200. For more information on Toovey’s specialist furniture sales click here. By Revd. Rupert Toovey. Originally published on 9th October 2013 in the West Sussex Gazette.